Every developer knows that internet security is very important nowadays. So, how do you protect your users from malefactors and have them trust your site’s security? The answer is SSL! 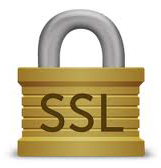 SSL is a technology used by web hosts to provide encryption of data between the browser client and the domain. With the use of SSL, the data are encrypted and transmitted during the online transaction. SSL creates a private communication channel for the transmission of sensitive data. This is very important if you are operating an online store, where you need to process online orders and do transactions with credit cards. We have great news for you! Custom SSL certificates are available now on Jelastic Platform! This allows a level of security for your domain names that you have never had before. With Jelastic, hosting applications that need SSL support becomes as easy as one click action. Jelastic provides ability to upload and use custom certificates to environments. Your environment just should have custom domain and an external IP attached. 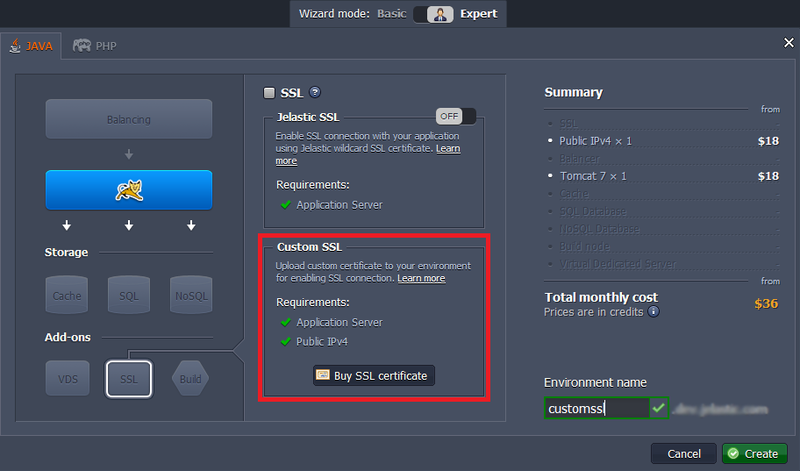 To add your Custom SSL to your Jelastic environment you need to have a domain name, a server key, intermediate certificate (CA) and domain certificate. So, buy a Domain name using any domain registrar. With OpenSSL (or any other tool) generate your server key and on its basis create Certificate Request. Send this Certificate Request to a desirable Certificate Authority (CA) company. A CA checks the identity of the domain owner and (if everything is ok) sends back Intermediate certificate and Domain certificate. 3. In the Environment Topology dialog, pick your application server (for example,Tomcat 7). Switch on Public IP. Type the name of your environment and click Create. In a minute your environment will appear in the list. 1. Copy the external IP you’ve got after creating the environment. To do this, click additional button for the server in your environment. There you’ll see your Public IP. Copy it. 2. Go to your DNS Manager. 3. Set A Record to point your domain to your Public IP address. You can find the detailed instruction on how to do this here. 1. Click Settings for the created environment. Choose Custom SSL point from the list. 2. Upload Private key, Intermediate certificate (CA) and Domain certificate. Click Save. That’s all! Now you have SSL for your custom domain name! Enjoy!